At least eight Palestinians have been killed in clashes during an Israeli army raid on the Gaza Strip - the deadliest incursion for weeks. 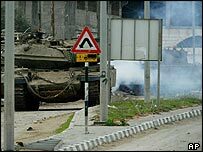 Palestinian militants opened fire as tanks went into Gaza City's al-Zeitoun area, witnesses said. The fighting came hours before Palestinian Prime Minister Ahmed Qurei had talks with United States Middle East envoy, John Wolf. Mr Qurei told reporters the killings had been raised in their discussions. He said he had called for an end to what he described as "this continuous aggression against our people". Mr Qurei said his talks with Mr Wolf had covered all issues, including how to make progress under the US-backed roadmap plan for peace. He said he was happy that the Americans were getting involved in the peace process once more, and added that he had asked the US to help prepare the way for him to have a meeting with his Israeli counterpart, Ariel Sharon. Mr Wolf, who has been away from the region for four months, met Israeli Foreign Minister Silvan Shalom on Tuesday. The BBC's James Reynolds in Jerusalem says the roadmap plan only survives at present in the minds of the most optimistic peacemakers. He says no-one is expecting Mr Wolf's return to the region to bring about any great breakthroughs. Palestinian human rights monitors quote eyewitnesses as saying the troops fired live bullets and artillery shells at civilians, civilian property and an ambulance during the raid. They say four civilians not engaged in military activities were among the dead and many others were wounded, including an ambulance driver. "The bloody message has been received... and the Palestinian people will know how to respond to it," Islamic Jihad leader Mohammed al-Hindi was quoted as saying by Reuters news agency. There was quick condemnation of the raid from the Palestinian Authority, with a spokesman for Yasser Arafat appealing for the UN Security Council to halt such action. "This new massacre aims to provoke an escalation and sabotage the peace efforts by the Arabs and the international community," Nabil Abu Rudeina was quoted as saying by AFP. The raid is the deadliest since an Israeli operation against the Rafah refugee camp more than a month ago which left nine Palestinians dead. The presence of the settlers at Netzarim is loathed by the people of Gaza, says the BBC's James Rodgers in Gaza. The settlement - built on occupied Palestinian land - lies at a strategic junction controlling traffic between the north and south Gaza Strip where there is frequent disruption to Palestinians. The Israeli army said the cells being hunted had launched 24 separate shooting attacks and fired 133 mortar shells against Netzarim settlement. The Jewish settlers say they are determined to stay despite recent speculation that the Israeli Government might eventually order the area to be evacuated. "At least one bystander was killed, the Palsestinians say, though most of the dead were gunmen"